The Sub8 is a small yet deceptively powerful subwoofer designed to extend the low frequency capabilities of any nearfield monitoring system. 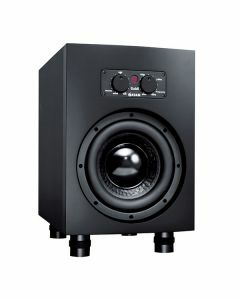 The Sub8 houses a robust 8.5” woofer with an 1.5” voice coil, and is driven by a 160W ICE Power amp. This amp stays cool while handling maximum power levels, even if they are sustained. The front baffle features two motorized knobs that let you tailor input level and crossover frequency settings for the best performance in your studio. The ADAM Sub8 is condensed but commanding and comprises a top of the range 8.5” woofer and large 1.5” voice coil, driven by a 160W Ice power amp. Designed to extend the low end of any nearfield monitoring system down to 30Hz, the Ice power amp ensures this is the case if maximum power levels are sustained, while remaining cool, over the course of long mixing sessions. Two motorised knobs sit on the front baffle, allowing tailoring of input level and crossover frequency settings. A wireless remote is included with the ADAM Sub8, allowing you the ability to control sound reproduction from your favoured listening position. The ADAM Sub8 offers linear bass reproduction down to 28Hz, making it an ideal to addition to nearfield monitors. A maximum peak sound pressure of 110dB at 1m provides powerful, compression-free sound reproduction even at very high sound levels. The Sub8 complements ADAM’s AX monitor series perfectly, making them an ideal combination for any studio set up. That being said the ADAM Sub8 is intended to function optimally in smaller rooms up to 20 square metres.